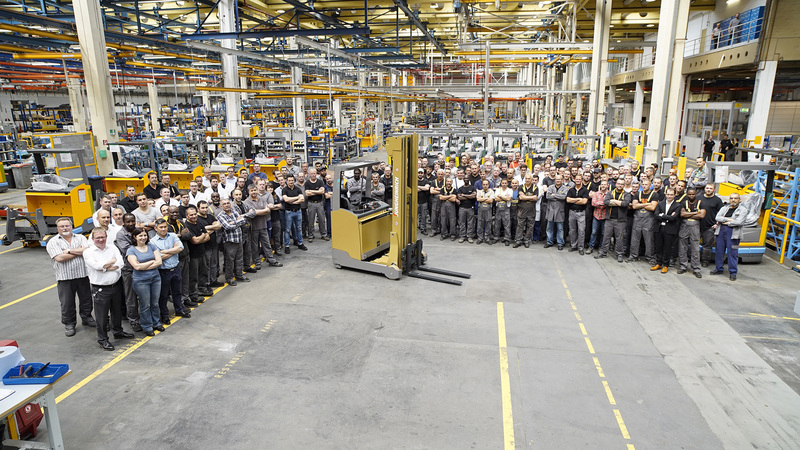 Jungheinrich today celebrated the fiftieth anniversary of its plant in Norderstedt, Schleswig-Holstein. The Hamburg-based intra-logistics expert has been producing industrial trucks and storage technology for the global market in the district of Friedrichsgabe since 1967. The Group has since invested over EUR 230 million in the plant directly adjacent to the Altona-Kaltenkirchen- Neumünster railway route towards Kaltenkirchen. Jungheinrich assembles electrical high-lift trucks, reach forklift trucks and low-platform trucks on this site across 214,000 m2. In 2016 alone, 47,380 Jungheinrich vehicles left the production line in Norderstedt. Together with the shareholder family, the Board of Management, Supervisory Board and employees celebrated the fiftieth birthday of the Jungheinrich plant as part of a large family festival. The highlight was the unveiling of the millionth forklift truck by the two daughters of company founder Dr Friedrich Jungheinrich. “At fifty years of age, the Jungheinrich plant in Norderstedt is older than the town of Norderstedt itself, which was established three years later. From the very beginning, Jungheinrich focused on solid growth. Production of our millionth vehicle is evidence of the success and importance of our oldest plant outside Hamburg. Without the fantastic commitment of everyone at the site over the past five decades, this development would not have been possible,” emphasises Hans-Georg Frey, Chairman of the Board of Management of Jungheinrich AG. With its approximately 1,300 employees, Jungheinrich Norderstedt AG & Co.KG is today one of the largest employers in Schleswig-Holstein. Around 600 young people have been trained in various skilled trades at Jungheinrich in Norderstedt since 1967, over half of whom still work at Jungheinrich. “Our employees’ training ensures the quality of our products. Jungheinrich in Norderstedt has for fifty years focused on sound training as a foundation for the professional and personal success of the people working here,” summarises Nils Sander, Managing Director of Jungheinrich Norderstedt AG & Co.KG. In addition to the production lines, the plant premises in Norderstedt today also accommodate the Jungheinrich Training Center. Training rooms with modern equipment and large spaces for working on and learning about vehicles and storage racks on all Jungheinrich lines have been created across almost 8,000 m2. Up to 5,000 people can train here every year. The Jungheinrich research and development centre for electromobility and modern lithium ion batteries is also accommodated at Norderstedt. In the Energy and Drive Systems division over 200 employees are working on efficient and environmentally friendly electrical drives for the future. Jungheinrich is currently the only manufacturer of industrial trucks that produces its own lithium ion batteries. The batteries are manufactured in the Norderstedt plant. Due to the globally growing demand, the Group is planning to significantly expand its manufacturing capacities.